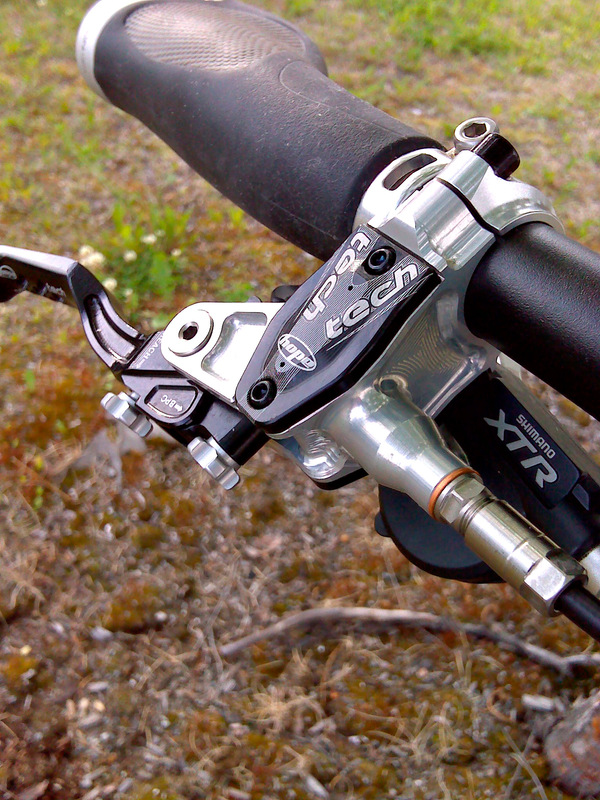 After upgrading my drivetrain to XTR components, it became apparent just how mediocre my original Magura brakes were. They were about 8 years old and the master cylinders no longer returned to the original position, and as a result the brake pads dragged on the rotors, producing a horrible squeal when braking. To counter this, I had to increase the distance between the pads and the rotor, but then I had very little braking power. It was barely tolerable when riding to and from work – there was no way the old Maguras were going to handle 2,300 miles across Europe – through, up, and over the Alps. So, I once again opened the wallet (very wide) and upgraded. I replaced the Maguras with Hope Tech M4 hydraulic disk brakes. 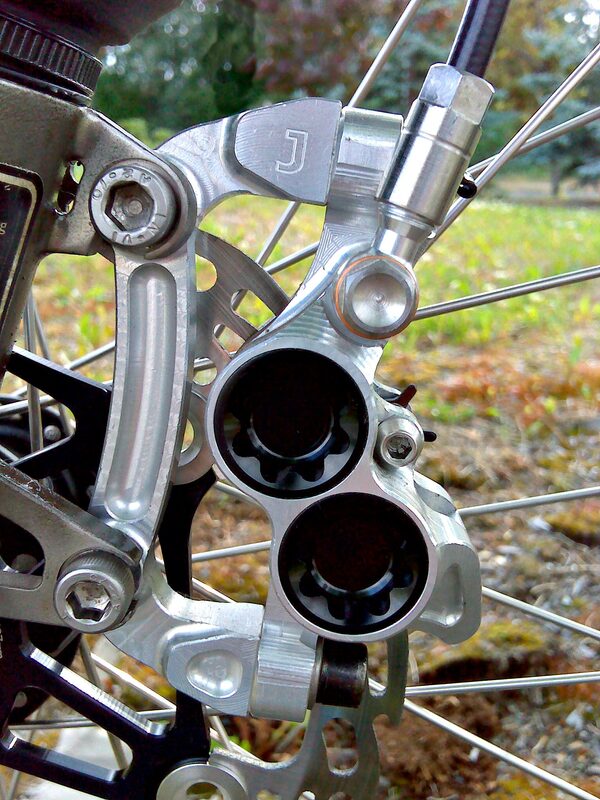 These are like the Ferrari of bike brakes. The calipers and lever bodies are CNC machined out of solid blocks of aircraft-grade aluminum. The calipers have 4 cylinders (2 on each side) providing the braking force. 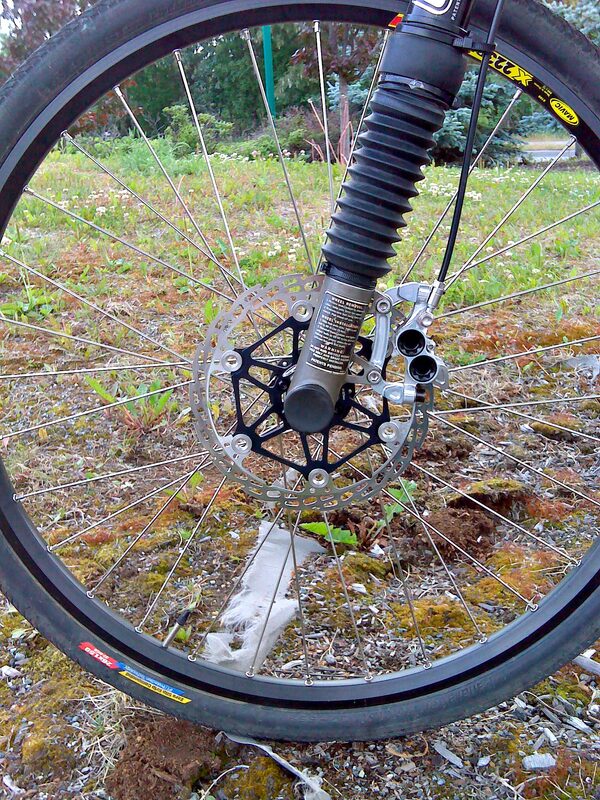 Of course, the important thing with brakes is how well they function – and these brakes are superb. But they also are just outright eye-candy – 100% bike bling! I had lunch at a downtown cafe today, and while I was eating there was a constant stream of passersby stopping and gawking at my bike. It was very entertaining watching them pointing at it and bending down to get a good look at the brakes. I saw more than one person mouth the word “Wow!” These things are just so much more than what people are accustomed to seeing on a bicycle. They have fantastic stopping power and look absolutely awesome – and despite the cost, they are definitely a worthy upgrade. 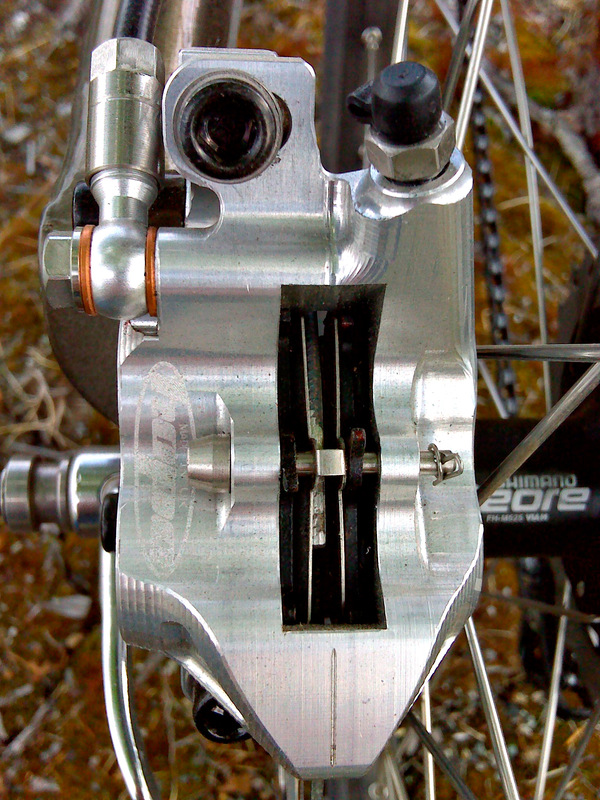 Close-up view of the left-hand side of the front caliper. The two black things are the caps on the cylinder bores. There are two additional cylinders on the right-hand side of the caliper. Top view of the rear caliper. The entire caliper is carved from a single block of aluminum, rather than the typical design of having two separate halves bolted together. View of the brake lever. Like the calipers, the lever body is machined from an aluminum block. The lever has two adjustment thumbscrews - one for the lever reach and one for the master cylinder "bite point", or the amount of lever action needed before the brakes kick in. This entry was posted on June 27, 2010 at 7:40 am and is filed under Bike & Gear, Preparations. You can follow any responses to this entry through the RSS 2.0 feed. You can leave a response, or trackback from your own site. Standing by for more progress reports.